Results: Over years of meticulous research into the popular, prototypical catalyst titanium dioxide, a clear view of the atomic-level interactions has emerged, but many of the answers lead to more questions. Three scientists at Pacific Northwest National Laboratory were recently invited to take on the challenge of gathering, analyzing, and summarizing the latest answers and examining the questions about titanium dioxide, specifically the rutile form. Their analysis appears in Progress in Surface Science. Why It Matters: Rutile titanium dioxide shows tremendous promise for applications that range from energy production to air and water purification. Making these promises a reality requires not only a detailed characterization of the material, but also a clear understanding of how the material behaves in different circumstances. 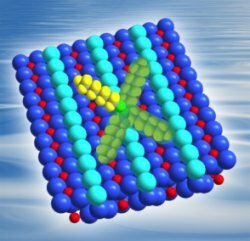 This article by the PNNL trio collects, into a single, well-referenced source, the latest understanding of the material's behavior. Methods: Rutile TiO2(110) has long been recognized as an ideal model for basic studies of titanium dioxide. While numerous international research groups have explored the catalyst's basic properties over the past 20 years, a detailed molecular-level understanding of TiO2's catalytic and photocatalytic processes has proven elusive. "It is only now, says Dr. Zdenek Dohnálek, a senior scientist at PNNL, "with recent advances in technology and theoretical approaches, we are starting to develop a more complete picture of this important catalyst." As leaders in catalyst science, Dohnálek and his colleagues Dr. Igor Lyubinetsky and Dr. Roger Rousseau were asked to author a review article (Progress in Surface Science. 2010. 85:161) that integrates the recent research of hundreds of international scientists with PNNL's ongoing experimental and theoretical work. The objective was to provide an insightful picture of reaction mechanisms, surface intermediates, and final products for the TiO2(110) reactions with water, oxygen, and alcohols. With supporting theoretical calculations, the team accurately characterized dynamic processes at high temperatures, including diffusion of surface intermediates and charge mobility important in surface reactions on TiO2. Among the more interesting findings documented by the team was the mechanism of hydrogen atom "hopping." During adsorption of water molecules, water dissociates and forms two hydroxyls—species containing an oxygen atom bound covalently with a hydrogen atom. Contrary to what was expected, these two hydroxyls are not the same. One of the two will always move. Using scanning tunneling microscopy (STM) at EMSL jointly with theory, the team showed that this movement is determined by the location of charge in the TiO2 subsurface. The team also documented the development of perhydroxyl radicals, which are formed through the transfer of a proton to an oxygen molecule. "People have been trying to prove the existence of this species for a long time, so we were quite excited to see it," said Dohnálek, adding that this and other findings help answer basic and unresolved questions about TiO2 surface dynamics. The PNNL scientists supplemented recent research with two approaches-experimental to measure site-specific reactivity, and theoretical to determine the underlying reaction mechanisms. The team's initial focus was the characterization of defects and the distribution of excess charge. They next examined the role of individual surface sites and the effect of available charge in adsorption processes. Finally, the speed of adsorption and other factors in charge movement were evaluated. With this information, the scientists modeled charge diffusion as well as molecular movement. PNNL theoreticians validated experimental work utilizing density functional theory and the modeling capabilities of NWChem, a computational chemistry package that runs on supercomputers. Throughout the study, diverse aspects of the TiO2 surface were examined, as researchers focused on products, kinetic barriers, electron-induced processes, and the interdependence of rotational, vibrational, and electronic states of molecules. What's Next? The research team is continuing to study rutile titanium dioxide. They are working to characterize the spatial localization, transport, and origin of the excess charge. Acknowledgments: This work was funded by the Department of Energy, Office of Science, Basic Energy Sciences. Much of this work was performed with scanning tunneling microscope and molecular beam scattering instrumentation available at DOE's EMSL, a national scientific user facility. The research was done by Zdenek Dohnálek, Igor Lyubinetsky, and Roger Rousseau, all of PNNL.